I’m thrilled to once again be attending the annual meeting of the Society for Pentecostal Studies (SPS). This year it is being hosted by Regent University in Virginia Beach, VA from March 1-4 (which promises to be much warmer than Karlstad). The topic is one I find close to my heart — “Pentecostalisms, Peacemaking, and Social Justice/Righteousness” and this year I will be chairing one of the Bible sessions. It looks to be an interesting conference. You can view a PDF of the sessions HERE. I am thrilled to be able to chair the session (especially as it pertains to the joint topics of Pentecostals and the OT). Also, its a delight to be able to chair for Chris Green…who I’ve found helpful in several previous sessions of SPS concerning the integration of the sacraments — and a sacramental appreciation — and Pentecostal theology and praxis. On a related note…I realized I still haven’t joined Pentecostals and Charismatics for Peace and Justice, but will have to rectify that this year. By joining you can elect to receive a PCPJ mug, shirt or book (Pentecostal Pacifism by Jay Beaman). 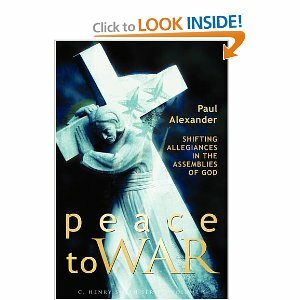 This group was formed by Paul Alexander (and several others of like mind) of whom I intend in 2012 to read his “Peace to War: Shifting Allegiances in the Assemblies of God”.